Joseph Scott Morgan will never again have pine trees in his yard. Following the EF-3 tornado that tore through Jacksonville on March 19, Morgan, his wife and their two dogs, emerged from the bathroom where they sought shelter to find five “monstrous” pine trees had destroyed their home. Having served as forensic investigator with the Jefferson Parish Coroner's Office in New Orleans for six years- prior to serving as senior investigator for the Fulton County Medical Examiner's Office in Atlanta for 14 years – Morgan had ridden out numerous hurricanes, but tornados are a different beast altogether. As Distinguished Scholar of Applied Forensics with JSU’s Center for Applied Forensics, Morgan often appears on CNN and Law and Crime Network, providing expert insight into the true crime cases grabbing headlines. But only hours after the tornado, Morgan was on TV giving his perspective on a different kind of devastation – live Skyping with CNN anchor Carol Costello. Morgan even served as guest speaker for the Rotary Club in Fort Payne less than a week after the tornado, wearing a pair of donated dress shoes. Morgan has become a familiar voice in the maelstrom of true crime TV shows and their associated podcasts. He is a frequent guest of both Nancy Grace and Ashleigh Banfield, appearing via Skype from his living room, which he calls “JSU Studio 1-A,” and in the background is the ever-present blue banner promoting JSU’s Center for Applied Forensics. Whether he’s discussing famous cold cases like Jon Benet Ramsey or more grisly murders like the “Womb Raider” (don’t ask), Morgan gives his expert opinion for free with only one caveat. “They have to mention JSU,” he said. “JSU and Jacksonville will forever be my home. 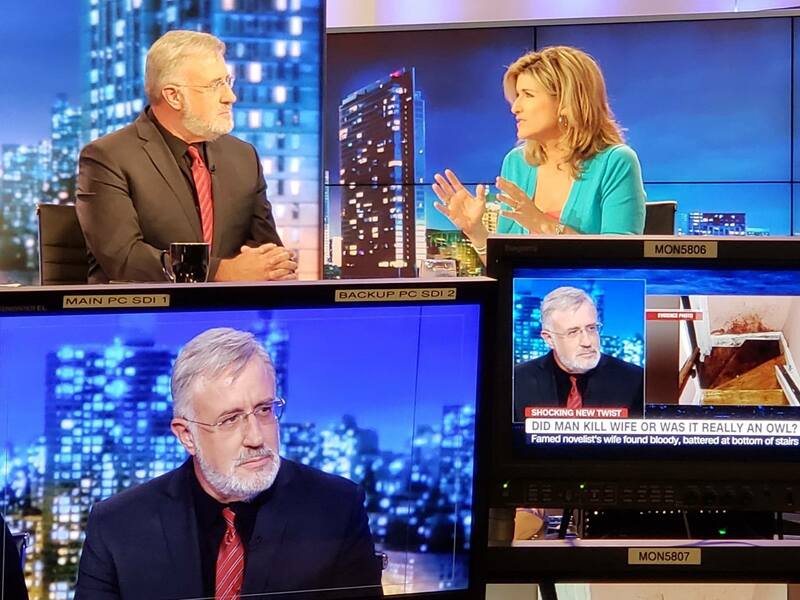 When I’m on TV, whether it’s with Nancy Grace or Ashleigh Banfield, I always stick within the boundaries of good science, which is what we champion at JSU. I’m honored to be a part of helping to spread the word about that."